For my baby sister Larissa to come back from her travels in Southeast Asia, Australia and New Zealand. And what did she come back with? A suitcase full of vintage clothes (more on that later), custom clothes and magnets (love souvenirs). She had this dress custom made in Hoi An, Vietnam. The bottom part is made of Vietnamese silk in a colour I once heard described as Indian teal. She also had her boots custom made in the same city. Leather and lovely. 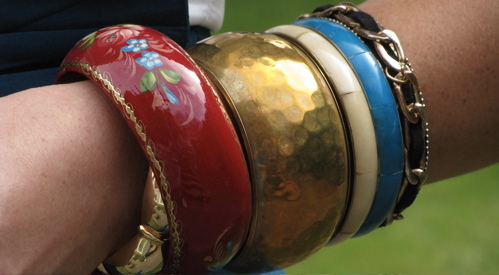 Her red bangle is from an entirely different part of the world. She got it in Kyiv, Ukraine (this gal has been to 28 countries — 29 if you count Vatican City). A custom-made silk dress and piles of bangles are beautiful. But when they remind you of your adventures? Doesn’t get any better than that. Okay, so I love and am so envious of your sister. I know envy is a sin, but seriously, she’s so cool. oh man, those boots and silk skirt, both custom made, i’m soo jealous! And “Indian Teal” – wow, you know I have an obsession with colour names. How great it is to have sisters where you can raid their closets! How does she do it?! So jealous. Awesome finds she brought back. I want to travel… boo hoo. I bargained those boots down sooo low, the ladies really didn’t want to sell them for that cheap, but since my boyfriend got a pair of shoes made too they let me have them! I believe the saying they use is “good for me, good for you”. The dress was almost a lost cause! I made the mistake of trying to clean it myself and the dye from the “Indian teal” ran all over the top, luckily my dry cleaner was a saviour and got it all out. It cost more to clean it than it did to get it made! Thanks for the post Kels! I’ve been there many times and still wanna come back! Did u get to try the local food? It gives me one more reason to want to travel to the other side of the world. We ate tons of the local food, I ate a bowl of steaming hot pho literally every day. We would get it at the side of the road which we deemed “mama’s kitchen” (read: cooked by some older lady, served to you by her family where you sit on plastic chairs and eat off plastic tables). We got sick fairly regularly but it really didn’t stop us and when I go back, I will do it like that again! Checked this out upon recommendation from Larissa and to see all the stuff she bought – love the site. Hope all is well with the Dundon clan in Canada. Best Wishes from Raining Ireland! Thanks Aoife! I wish I were in rainy Ireland. I loooooove pretty, cozy, friendly Dublin.